An important part of maintaining your reef tank is the addition of reef salt. The reef salt is used to introduce vital compounds the corals need to grow and become strong and hearty. There are a number of different types of salt sold for use in reef tanks, so it is important to pick the best for your tank. With many options available, it is common for tank owners to get confused, especially with all of them claiming to be the best at what they do. To help you make up your mind, we have reviewed some of the best reef salt types and put them together in this guide to get you started. What is the Best Reef Salt Mix? How Much Reef Salt Per Litre? There is so much you can achieve by using this type of reef salt. It is specially formulated to be the best synthetic sea salt that you can get right now. This is the reason you can frequently find it being used for both the hard and soft corals. It has impressive features and benefits such as adding calcium, vitamins, magnesium, and trace elements to the water. You also get some special additives important for removing the harmful heavy metals such as copper that might be dissolved in the water. The presence of calcium is important for the growth of the large and small stony corals. The same goes for the coralline algae. The reason you need calcium is that the hard corals remove the dissolved calcium from the water as they grow. This calls for adding more calcium to supplement what has been used up by the corals. This is done through using reef salt containing the calcium additive. Thanks to the impressive quality of this salt, we get the benefits of a rapid rate of dissolving in addition to the same characteristics as natural seawater. As an additional benefit, this mixture will also not separate while being kept in the bag or box for a long time. This is a big plus, ensuring that the salt will still work as expected. The chemical formula will remain uniform regardless of the production date, so that it continues to be effective until the next time you use it. This salt type helps a lot by matching up to the majority of the ions in the natural seawater. Some of the ions might be more prevalent in the salt, as they are identified as ones that might have been lost over time from the aquarium water. Having the low levels of organic carbon also helps in preventing the growth of some bacteria and algae in the aquarium. If you want the coral life in your tank to remain in top condition, then you need to get the right type of reef salt. As for this coral pro salt, you are sure to appreciate the many benefits that it has to offer. This salt is often used in reef aquariums to encourage accelerated growth of the corals. After a few weeks of using this salt, you should see an improvement in the vitality of the corals in your aquarium. This salt type has just the right ratio of calcium, carbonates, and magnesium compounds for your reef tank. This combination will ensure that the corals are provided with the best compounds, which are important for them to grow efficiently. With all corals having built their skeletons by absorbing the minor, major and trace elements, it should be easy for them to get all the right compounds from the salt easily once it has been dissolved in the water. This reef salt is considered by many to be one of the best for providing the basis for accelerated healthy growth of the corals. This works for all different types of corals, such as the soft, SPS, and LPS corals. 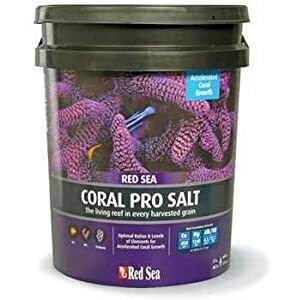 If you have SPS coral frags, then this is the best salt you can get today for your tank. The salt comes in a 175-gallon bucket, which should be enough to provide the required supply of salt to your aquarium for quite some time. This is a fully synthetic marine salt that has been created for cultured corals. The formula is important, assuring the best possible conditions for the marine life in the reef aquarium. This reef salt comes with macronutrients and micronutrients all contained in one formula. The work of such nutrients is to meet the demands of most marine life and encourage their proper growth while in the reef aquarium. The best part is that once the salt has been dissolved, you can use the marine water immediately without having to wait for additional hours like other salt types. For those who are setting up the new aquariums, it is even recommended that you can place the first animals in the tank after 10 days. The salt is made to be bromide free, which gives you the option of using a wide range of filtration systems for the marine water. However, you are advised to use reef salt filtration systems if you want to maintain the water properly. Thanks to its custom compounds, this salt has proven to be great for more demanding types of corals such as the SPS and the LPS corals. Even if the filter does come with probiotic bacteria or other growth media, it will still work as expected. The manufacturer made this salt to be nitrate and phosphate free so that the toxins can be kept at a minimum when using it. 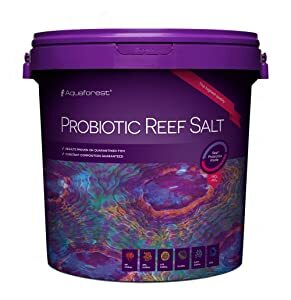 You can always expect that using this type of reef salt will provide great benefits for your reef, so go ahead and try it out today. 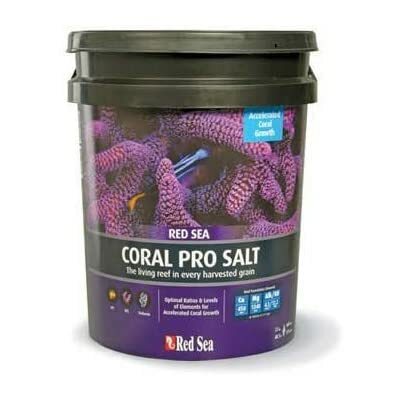 This type of salt has been formulated to include elevated levels of calcium, strontium, magnesium, and other important elements needed for a reef tank. These essentials are vital for making sure that there is proper growth of the coral. You might have seen some of the other types of salts promising the same, but this one for sure will deliver on your needs. 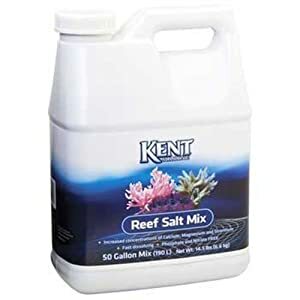 You will see some of the best results in no time once you have used this reef salt for your aquarium. The compounds are not the only things that you get with the use of this type of reef salt. It has also been designed to help skeletal structure development of the coral reef. This in turn should help to boost the reef vitality. The 50-gallon size should be sufficient to help you keep your tank supplied with enough reef salt at all times. When these two are compared, the reef salt is seen to have more elevated levels of calcium, iodide, and magnesium concentrations than the marine salt. There are still some similarities, such as both types of salt will test negative for nitrates, as the nitrate levels are negligible. 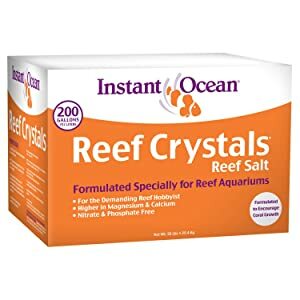 If you are new to buying reef salt for your aquarium, then you should opt for the Instant Ocean Reef Crystals reef salt. This salt comes from a top brand that makes the top rated reef salt for use in an aquarium. The salt is further made to feature more of important compounds such as calcium that promote the growth of both large and small corals. You will always get the best coralline algae development when using this product. The manufacturer also included trace elements that will ensure vigorous growth of the corals. With the metal detoxifiers also used in this salt, you can be sure that the heavy metals found in the domestic water supply will be easily removed. The question of which is the best reef salt mix is a common one in many forums. Many people are happy to give their opinion on what makes the reef salt mix, but what is important is that you understand the building blocks of the best mix. The first thing to keep in mind when choosing a reef salt mix will be differences between different brands. All the brands will have a label that shows what to expect from their sea salt. The composition of the salt will also be shown on the label. The composition can vary widely from brand to brand, but some have common ingredients too. The varying composition of the salt mix will create the differences between one brand and another. If you want to end up with the perfect mix, there are a few things that you have to consider when making your decision. The common parameters to compare between brands include the amount of calcium, magnesium, and the alkalinity. The calcium compound is the most important component in the reef salt. Corals and other types of invertebrates need it for building their skeletons. The concentration recommended for good results is 400ppm. The PPM means part per million. Magnesium is another important mineral to have in the reef water. It is often seen to be the most abundant trace mineral found in saltwater. Magnesium will work together with the calcium to help balance the alkalinity of the aquarium water. The recommended concentration is 1250 ppm. The alkalinity is going to affect the pH level of the reef tank. With the addition of the salt, you can expect that the water will become more alkaline. You have to consider the alkalinity to make sure you understand the level of bicarbonates in the water. You might have to adjust the alkalinity where possible. The alkalinity of the saltwater aquarium is recommended to be at 8 – 11 dkh. Now, back to the question. From the details above, you want to have calcium in the range of 400 ppm, magnesium 1250 to 1400 ppm, and alkalinity kept between 8 to 11 for the salt mix. This is going to vary from one brand to another, but in most cases, it will be 35g per liter of RO water. You can always check the label for the recommendations from the manufacturer. The first thing you will have to do is get yourself the best sea salt for your aquarium. You can easily buy this from a store near you that sells aquarium-related stuff. Most of the time, you are going to get the dry synthetic reef salt so that you can mix it with water. Next is to gather all the necessary supplies for the work. You will need water for your mixing, and the best choice is to use deionized water for this process. You can only use tap water if the quality of the water is excellent. You can purchase deionized water from a store close to you. Additional supplies for the process include a clean bucket, submersible heater, stirring tool, hydrometer, and a floating thermometer. Fill the container with deionized water and add salt in the right amount as directed by the manufacturer. Each manufacturer offers information on how much water should be used to dissolve a certain amount of salt. Let the mixed saltwater settle overnight before you can add it to your aquarium. Keeping the reef aquarium within the conditions helps a lot when it comes to making sure that you have the best corals in your tank. Now that you know more about the best reef aquarium salt, go ahead and choose one for your aquarium. Make sure that you understand the composition of each type of salt before buying. Having the right type of composition helps a lot with choosing the best salt for your marine aquarium. Within a few weeks of using the right reef salt, you should be in a position to see some differences. The differences mean that your corals look even lively and better. There are too much cost of that kind of salt.